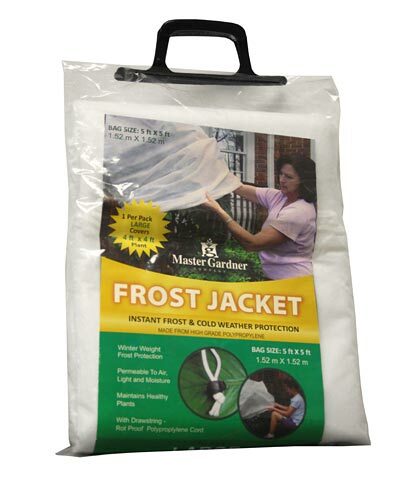 Shield your outdoor plants from cold weather using the Master Gardner Frost Jacket. Covering your plants when frost is expected helps insulate the air around them, preventing cold weather damage to their leaves and roots. This generous bag is made from high grade polypropylene, and can easily cover a 4' by 4' shrub. The white color and innovative design allow air, light, and moisture to reach your plant, and its winter weight keeps the air around the plant insulated up to eight degrees warmer than the external air. A plant bag can also keep insects and other pests away from your flowers and vegetables, for less pesticide use. A drawstring at the base of the bag helps you fully protect the plant, closing the cord around its stem or trunk. Increase your planting season and help your plants survive chilly nights using this Frost Jacket.